This black ash basket with antlers was handcrafted in Nedrow, New York by husband and wife duo, Ronni-Leigh Goeman and Stonehorse Goeman in 2004. 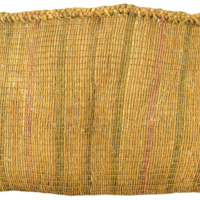 The base of the basket is narrow at 3 1/2" in diameter and is woven from sweet grass. The lid has a 2" band of braided woven sweetgrass at the rim, a 2 1/2" band of curly black ash on top of the lid, a 3/4" band of flat woven black ash, then a flat band of woven sweet grass. Total diameters are 9 1/2" by 14". It is created and detailed with black ash tree, braided sweetgrass and tufted horse hair on the top accompanied by a carved deer antler stand (MSU Museum). A Chippewa bandolier bag is a large, heavy, and intracitely beaded bag that is traditionally worn by men diagonally across the body. They represent a form of prestige for many of the tribes who make them. 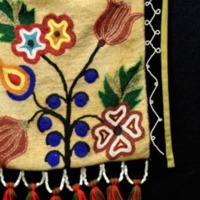 The bag's floral designs are indicative of the Great Lakes Native American arts and showcases various beadworking techniques. The amount of work needed to make a bandolier bag suggests that it may have been produced together by generations of indigenous women. 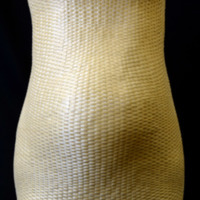 The basswood woven bag, at a first glance seems like a simple object, yet it is embeded in a web of complexities. These four views reflect the theme of a cycle of renewal, exploring different components that add to the intricacy of this object and its relation to different groups of people. 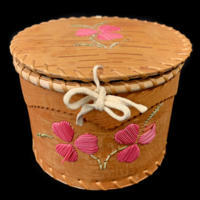 This small, circular birch bark container features quillwork flowers that are dyed pink and green. Each flower has three petals, suggesting the red clover (which has been shown to relieve menopausal symptoms, as studied here). 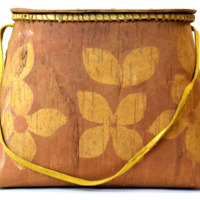 The lid of the container, attached with leather ties, is embellished with the same floral quillwork. Rose Nance Archedene crafted the container, which measures 4.5 inches in height and 6 inches in diameter. The donor of the handcrafted object notes the basket was made by native peoples in the Northwestern woodlands region of Canada. Lidded birch bark container made from one solid birch bark piece, stitched together with root. The container has a solid birch bark lid and a hide handle. On the outside of the container are several etched designs, mostly floral and geometric. This is a Black Ash basket created in 2008 by Cherish Parrish, a member of the Match-e-be-nash-she-wish Band of Pottawatomi Indians. She is of Ottawa descent and lives in Michigan. The basket is entitled "The Next Generation." The dimensions of the basket are 36.5" x 15.0" x 12.2" and is made from Black Ash tree splints, with a sweetgrass trim at the top. It is woven to represent the belly of a pregnant woman and illustrate the significance of pregnancy in Native American socieities. Parrish also used Black Ash weaving in creating the basket to bring attention to the plight of the endangered Black Ash trees in the Great Lakes area. 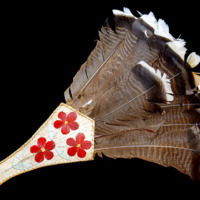 This fan is composed of eight turkey feathers arranged in a flat diamond-shape with the base made of two uniform pieces of birchbark sewn with a root twine. On the base of the fan there is extraordinary porcupine quillwork featuring three red flowers with green stems and yellow centers. At the bottom of the handle there are two yellow petals and one red petal connnecting the flower stems and petals together. A tag attached to the fan says "Ottawa-style porcupine on birchbark dance fan ($85)" indicating this is a contemporary piece. The handle is 10 1/4" long, with the feathers adding another 6 1/2", totaling 16 3/4 inches long. This is a quill box created in 1985 by Delia Beboning of the Ojibwe. She lives on Manitoulin Island, Ontario, Canada, and her has been displayed across the globe. 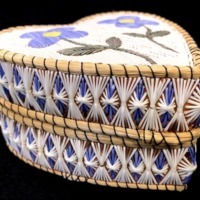 The box is made from birch bark, dyed porcupine quills, and sweetgrass, and is in the shape of a heart with two flowers on the lid. The designs are tight and fluid and are made with a high level of skill. It is in remarkable shape for its age, which also displays the skilled craftswomanship of Delia Beboning. This item is a Haudenosaunee crafted beadwork hat featuring organic designs and a wide array of raised floral beadwork over a velvet base with a butterfly or dragonfly at the back. The hat has a height of 4.5 inches and a diameter of 6 inches. It has been in the MSU Museum Native American Collection since 2013 (MSU Museum, 2013). Likely created by a Haudenosaunee woman, the hat is a piece of Indigenous women's history and illuminates their ideas and knowledge. 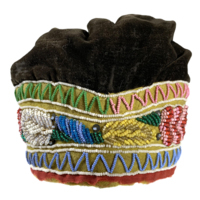 As written history often overlooks the perspectives of women, especially Indigenous women, artistic works such as this beaded hat preserve their history (Racette, 2009, 285). "This is a hand-carved, solid wood mush paddle. 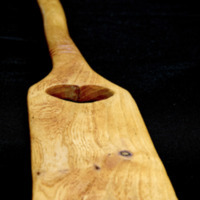 The paddle features two sets of carved grooves, one on the shaft and another near the throat. The grip of the paddle is carved into the shape of a heart. The blade of the paddle has a heart shaped removed from it. The tip of the blade is squared. Paddles like this are used to lift from kettles where corn bread is being boiled. The Iroquois call these paddles 'gatgun'yasshuwa'ne.'" (MSU Museum 2013). It is 40.5" long and 3.5" wide at the blade. Header image from MSU Museum on Flickr. This website developed in partnership with LEADR using Omeka.